Buying a tankless water heater should be a one-time investment. Choosing the right product for your home can save you from spending hundreds of dollars on unnecessary maintenance costs. So, if you want to make a good investment, consider all the benefits you’ll be getting with Rheem RTGH-95DVLN water heater. This water heater comes with plenty of advanced features and it runs on natural gas. Gas-powered models are more reliable in the long run and they have lower fuel costs as well as better performance in the cold weather. Some customers describe this Rheem water heater as a beast. Why? Well because your family could run the dishwasher, do laundry, hand wash dishes, and even take two showers at the same time without experiencing any lack of warm water. And, the best thing about this heater is that it will use energy sparingly since Rheem is one of the most energy-efficient options on the market. Who Is the Rheem RTGH-95DVLN best for? If this Rheem tankless water heater seems like it’s not the right fit for you, we recommend checking out our reviews for the rest of the Rheem product line. Smaller homes might consider the EcoSmart Eco 11 as a great alternative as well. 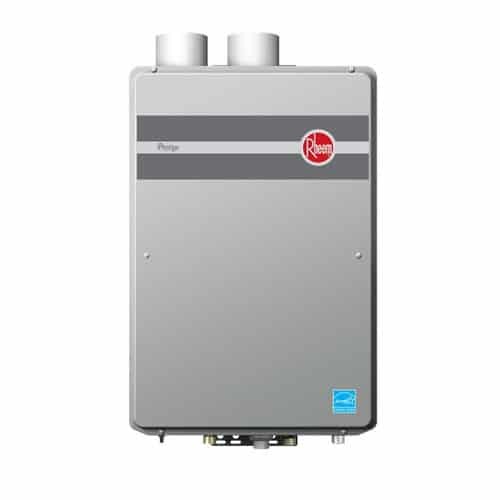 When it comes to advanced features, this Rheem tankless water heater has quite a few. First of all, it comes with a hot-start programming feature which reduces fluctuation in the water temperature. Then, it also has a safety Overheat Film Wrap (OFW) which provides protection in case of a breach of the heat exchanger. The EZ-Link cable technology allows the owners to connect two tankless water heaters that will operate as one. In addition, this water heater is also a low-NOx model. For the majority of water heaters, the venting is usually fitted outside. However, the venting of the Rheem tankless water heater can be placed both indoors and outdoors. In addition, this unit comes with a self-diagnostic system which constantly keeps the heater’s functions on check. If a problem arises, for example with venting or in the gas supply lines, the system will warn the user. This feature adds to the safety of the unit since it is very likely to prevent any accidents. 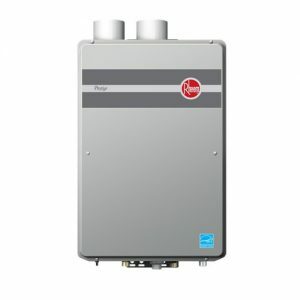 This Rheem tankless water heater has a very high flow rate of 9.5 GPM. This number exceeds the flow rate of many electric water heaters and is enough to heat three full-flow showers at once. Even at times of peak usage, this water heater will make sure that you never run out of hot water, even if your home has three or more bathrooms. The Rheem RTGH-95DVLN is Energy Star approved and its system has a 0.94 energy factor. This exemplifies how energy-efficient the product is and helps the buyer estimate how much power it may consume. The body of this unit is made out of stainless steel, ensuring that the main tank doesn’t get affected by any outside factors. Since this Rheem tankless water heater is a condensing unit, it also extracts heat from exhaust gases, making it more energy-efficient than the non-condensing models. High flow rate produces up to 9.5 GPM. It has a 94% energy efficiency rating. Comes with easy-to-use controls and safety features. Can be installed almost anywhere in the house. Equipped to deal even with freezing temperatures. As a premium model, it’s on the expensive end of the spectrum. It could be overkill for smaller houses. The minimum flow rate is 0.26 GPM, which is slightly higher than other heaters on the market. How gas does the water heater use when running? The unit can require up to 199,000 BTUs or about 200 CF or 2 CCF. However, energy consumption shouldn’t be a worry since this is one of the most energy-efficient models on the market. Does this Rheem heater suffer from the “cold water sandwich” problem? No, it doesn’t. But, there is a short delay when you first turn on the tap since it takes a few moments for the water to get heated. Does this heater have a warranty? Yes, Rheem RTGH-95DVLN has a 10-year warranty on the heat exchanger and 1-year warranty on parts. 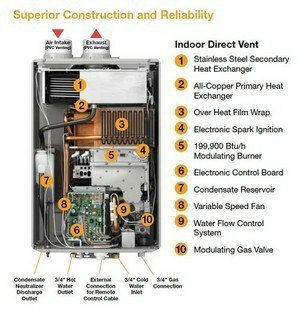 Should I buy the Rheem RTGH-95DVLN tankless water heater? The Rheem RTGH-95DVLN tankless water heater stands out from its competition and performs well in most conditions, ranging from cold outside temperature to high altitude. It is a great choice for all those who want to lower their electricity expenses by converting to natural gas and also take care of the environment. The unit is equipped with advanced technology that saves energy and supplies a continuous flow of hot water at a lower cost to operate.